In the past year, the scientific consensus shifted toward a grimmer and less uncertain picture of the risks posed by climate change. When the UN’s Intergovernmental Panel on Climate Change issued its 5th Climate Assessment in 2014, it formally declared that observed warming was “extremely likely” to be mostly caused by human activity. The Royal Society published a compendium of how the science has advanced, warning that it seems likelier that we’ve been underestimating the risks of warming than overestimating them. The American Meteorological Society issued its annual study of extreme weather events and said that many of those it studied this year would not have been possible without the influence of human-caused greenhouse gas emissions. 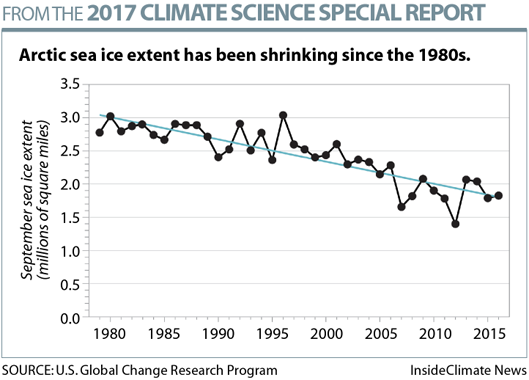 The National Oceanic and Atmospheric Administration (NOAA)said recent melting of the Arctic was not moderating and was more intense than at any time in recorded history. While 2017 may not have hit a global temperature record, it is running in second or third place, and on the heels of records set in 2015 and 2016. Talk of some kind of “hiatus” seems as old as disco music. Some of the strongest warnings in the Royal Society update came from health researchers, who said there hasn’t been nearly enough done to protect millions of vulnerable people worldwide from the expected increase in heat waves. “It’s a deadly tragedy in the making, all the worse because the same experts are saying such heat waves are eminently survivable with adequate resources to protect people,” said climate researcher Eric Wolff, lead author of the Royal Society update. Atmospheric scientist Kevin Trenberth of the National Center for Atmospheric Research said climate science has progressed in all directions since the IPCC report was published in 2014. He works with a group of scientists trying to update the IPCC reporting process to make it more fluid and meaningful in real time. One of the starkest conclusions of the Royal Society update is that up to 350 million people in places like Karachi, Kolkota, Lagos and Shanghai are likely to face deadly heat waves every year by 2050—even if nations are able to rein in greenhouse gas emissions enough to keep the average global temperature increase to 1.5 degrees Celsius, as per the Paris climate agreement. There’s also an increasing chance global warming will affect a key North Atlantic current that carries ocean heat from the tropics toward western Europe, according to a 2016 study. It shows the Atlantic Meridional Overturning Current weakening by 37 percent by 2100, which could have big effects on European climate and food production. That scientists are finding more links between melting Arctic sea ice and weather extremes like heat waves, droughts and blizzards. The U.S. Global Change Research Program, an interagency group whose work went through exhaustive peer review and emerged from the Trump administration’s political review mostly unscathed, also cited several emerging conclusions that are much clearer today than five years ago. Among them are changes in ocean ecosystems that go far beyond rising sea levels. Ocean acidification is increasing, as is oxygen loss, and scientists are more acutely aware than before of the severity of their impacts. In some U.S. coastal waters, these trends are “raising the risk of serious ecological and economic consequences,” the report noted. The most ominous of its chapters addressed the risks of surprises like “tipping points” or “compound extremes”—sucker punches, combination punches, and even knockout punches. “The more the climate changes, the greater the potential for these,” it said. “Uncertainty is not our friend here,” said Penn State climate scientist Michael Mann. “We are seeing increases in extreme weather events that go well beyond what has been predicted or projected in the past. We’re learning that there are factors we were not previously aware of that may be magnifying the impacts of human-caused climate change.” Among those are “subtle mechanisms involving the behavior of the jet stream that may be involved in explaining the dramatic increase we’ve seen in floods, droughts, heat waves and wildfires,” he said. “Increasingly, the science suggests that many of the impacts are occurring earlier and with greater amplitude than was predicted,” Mann said, after considering new research since the milestone of the IPCC’s Fifth Assessment, which served as the scientific basis for the Paris Agreement. “We have literally, in the space of a year, doubled our assessment of the potential sea level rise we could see by the end of this century. That is simply remarkable. And it is sobering,” he said. I have strong suspicions that climate change is happening faster than expected for scientists. It has been obvious to me for a long time that the scientists were pulling their punches because of the furious and dangerous hassle they encountered from the fossil fuel industry whenever they were honest. Perusing their data I have strong doubts that even now they are much too careful to expose themselves to the customary savage abuse by the capitalist pigs. We are going to pay a steep price for this tolerance of the money-greased abusers. Much more climate change and consequent catastrophe will be locked in before we begin our desperate race to salvage what we can. Our eastern seaboard will be mostly lost but the new shallow waters will not thriving with new life to sustain us. Toxic dumps and nuclear wastes and massive contamination from meltdowns will mutilate whatever life survives, and we won’t dare eat it. We will starve while suffering plagues from both pathogens and industrial poisons. It is already too late to avoid massive misery, but do you see the massive reforms, reorganizations, and projects needed to minimize the coming horror. No we don’t. The freaking Trump of a psychopathic fool is taking us exactly in the opposite direction. He is doing far more harm than the CIA and MOSSAD clowns did to us on 9/11. Everybody needs to wake up and get desperate. But we won’t. Bernaysian propaganda will keep most of us quiescent. Police state engineered from the false flag wreckage of 9/11 will see to the trouble makers. Why do you think our police are being loaded up with weaponry into military population control units? Eventually the police state itself will be unable to maintain order in the face of the march of catastrophes. When that will happen is anybody’s guess. All sorts of natural events are possible: a gigantic forest fire sweeping the West, a gargantuan tsunami from a plate shift off the coast of the Pacific Northwest, major movement along the San Adreas fault, a huge coronal mass ejection straight at the Earth like in 1859 (Carrington effect), the drop of an insecure hung volcanic mountain in the Canaries generating mile high tsunamis, an iceberg calving that release massive amounts of water it had restrained, another explosion in the Sunda Strait. At some point out society will have foolishly exhausted the elasticity to deal with it and will collapse. My bet is on another Carrington event. The Methane Bomb of ESAS will make this supposed “dire” warning article seem like warm milk and oreo cookies before a nice fairytale bed time story.